One of the world’s most popular and true all-around American classic rifles is the Marlin 60. This beautiful but boring little rifle is the definition of ease of use and reliability. Many people actually learn to shoot with this very gun and remain a fan forever. Part of the boring-ness of this rifle is that it is incredibly stream-line. Very plain and classic looking, but efficient and lightweight. It is a “let’s get down to business” type of gun. Considering these traits, let’s explore what could be the best scope for a Marlin Model 60. Maybe we can even find the exact scope that you’re looking to put on yours! The Marlin 60 has a sleek, streamlined design that makes handling and carrying a breeze. This is mostly thanks to the internal tubular brass magazine that holds 14 rounds of .22LR. This is a pretty good capacity considering that if hunting, these will probably last you all day. If more ammo is needed, the .22LR is smaller and lightweight, making it convenient to carry extra rounds in your pocket. A unique part of the internal design is the micro-groove rifling, which is just shallower rifling grooves. This contributes to the incredible accuracy of this gun, as it allows for less friction as the bullet leaves the barrel. Adding an accurate scope to this would be an awesome combination. The whole rifle weighs only 5.5 lbs, so it’s incredibly body-friendly if you’re out hiking around with it. It’s pretty much the perfect package for hunting small game, although it would have no problems taking on a bigger animal with a well-placed shot. Many people hunt coyotes at night with this rifle. Unlike most other .22 rifles, the Marlin 60 takes a .22LR instead of a .22 mag. The difference is size. The .22 mag is a more powerful round, but it is also longer, wider, and therefore heavier. Both are accurate, but the power, size and weight difference come with a price difference too. The .22LR (long rifle) is quite a bit more affordable and very easy to obtain. The Vortex Optics Crossfire II is a 3-9x40mm scope featuring a V-Plex MOA reticle that’s designed for a wide variety of hunting applications. The scope has a long eye relief and ultra-forgiving eye box allowing you to attain your sight picture and acquire your target quickly. The fast-focus eyepiece makes reticle focusing quick and easy. The lenses of this optic are fully multi-coated and anti-reflective providing a bright, clear view of your target. This scope is constructed of an aircraft-grade aluminum, single piece tube designed for superior strength and shockproof qualities. It also is O-ring sealed and nitrogen purged for waterproof and fog proof performance. Capped finger-adjustable reset turrets with MOA clicks that can be reset to zero after sighting in are other useful features built into this scope. You may also be interested in the 4-12 version of this scope. You can read more about it on our Vortex Crossfire II 4 12×44 review. Customers of this scope like the quality and the features for the price. They like that you can adjust the eyepiece for better clarity and that it’s easy to zero and holds zero well. Along with all this, Vortex has a great warranty in place and good customer service that customers truly appreciate. Customer complaints include that some of the versions of this scope have a hard time holding zero and that the image picture gets cloudy at higher magnification settings. Others have reported issues with the reticle rotating or being off-center. The Nikon Buckmasters II is a 3-9x40mm scope packed with a multitude of features including a patented BDC reticle, fully multi-coated lenses, an extremely bright sight picture, and a generous, consistent eye relief. Nikon’s patented BDC reticle is unique in that it has see-through ballistic circles down the lower half of the vertical cross-hair line which is amazing for long-range shooting, yet still offers a normal sight-picture for closer-range shots, keeping the cross-hair itself as the aiming point. It also allows for a dead-on hold at those long-ranges. The fully multi-coated optical system provides multiple layers of anti-reflective compounds on every glass surface allowing optimal light transmission from dawn to dusk, and bright, vivid picture images. As great as the lenses are, the rest of the scope is protected just as well. Being O-ring sealed and nitrogen purged, this scope is completely shockproof, waterproof and fog proof. On top of all these features, this scope is optimized for use with Nikon’s Spot On Ballistic Match Technology, Nikon’s no fault repair or replacement policy, and Nikon’s limited lifetime warranty. Customers of this scope love the super clear, bright glass, the ease of sight-in, and that it holds zero. Most adore the Spot On Technology, and this scope is very high quality, and a budget pick to boot! It seems that one consistent complaint about this scope is that some people have had issues with the reticle disconnecting. The Nikon ProStaff is a 3-9x variable powered compact scope with a 50mm objective lens. It features a special optical system where the lenses are fully multi-coated and transmit up to 98 percent of available light. It also features a quick-focus eyepiece, zero-reset turrets with a spring-loaded adjustment knob, and a nice, long 3.6 inches of constant eye relief. Other great characteristics of this scope are the simple, but accurate Nikoplex reticle, and a constructive housing that has been nitrogen filled and O-ring sealed for complete waterproof and fog proof performance. 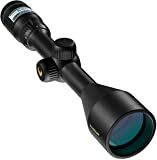 Customers love this scope, with many expressing that dollar-for-dollar, this may be the best quality scope on the market. They are tough and can stand up to heavy recoil, have a bright, clear image, and easy-to-use adjustments. On top of all this, Nikon offers a really great warranty, which just sweetens the whole package and makes it easy for customers to trust trying out this scope. Most customers are very pleased with this scope and very few had any complaints at all. The few complaints found were inconsistent and varied, so not really anything that seems to be a problem with the scope overall, just possibly individual defects. The Leupold VX-2 is a 3-9x40mm compact rifle scope with a duplex reticle. This scope has absolute waterproof and fog proof integrity and is ready for a lifetime in the field in all conditions. Flawless sight picture over a lifetime of hard use is the result of the DiamondCoat lens coatings on the exterior lens surface, which provides the ultimate in abrasion resistance. Also exclusive to Leupold is the Index Matched Lens System which provides exceptional brightness and extremely sharp resolution across the entire visual field. Additional features of this scope are the versatile 3:1 zoom ratio erector system that is ideal for any situation, and ¼ MOA precision finger click windage and elevation adjustments that offer absolute repeatability and dependability over a lifetime of extreme use. 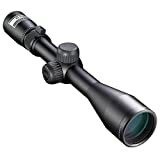 Customers of this scope praise the high quality, useful features and that it’s made in the USA. They love how lightweight this scope is, great field of view and extremely crisp optics. Many express that for a no-frills hunting scope, this Leupold VX-2 is the best they have ever owned. The only real consistent complaint seems to be an issue with the turrets adjustments either being too stiff and breaking or reversed and not adjusting. It seems to be an issue that is uncommon though. The Bushnell Banner Dusk & Dawn rifle scope is a 3-9x40mm high-quality scope with stunning HD clarity. It is a very simple scope and its claim to fame is its Dusk & Dawn Brightness (DDB) multi-coated lenses which increase clarity and brightness, making this scope ideal for low, changing, or failing light conditions. Other amazing features of this scope are the Multi-X reticle, capped ¼ MOA fingertip windage and elevation adjustments, and a good 3 inches of eye relief. To top it all of, it is 100 percent waterproof and fog proof making this a simple, yet effective scope in not-so-certain elements. It also happens to be a budget-friendly scope. Win-win. Most customers agree that this is a great scope for the money, and perfect for beginners. The glass is clear, clicks are solid and it holds zero pretty well. Most also will attest that it lives up to its name and works exceptionally well in weird lighting conditions. Other customers have expressed frustration, saying that it does not like to hold zero, fights adjustments, and is difficult to see the reticle. I would also point out a typo in the description stating that it has a 6-inch eye relief, then re-stating that it has a 3-inch eye relief. Double check to verify what exactly you are buying and that it is from a reputable seller. How many rounds will a Marlin 60 hold? – It can hold 15 rounds total: 1 chambered and 14 in the tube. What are the main uses for the Marlin 60? – This rifle is a great short-mid range small game rifle, vermin control, and target shooting. It is excellent in that, not only is it an accurate, lightweight and popular rifle, but the gun itself is relatively inexpensive and the ammunition is very affordable. It is easy to handle without much recoil, so it is a great beginner rifle. The Marlin 60 is a simple, yet effective hunting and target shooting rifle. It is best suited for short range, small game animals or vermin control. It is incredibly accurate, lightweight and stream-line with micro-groove rifling instead of normal rifling, which deforms and cuts large grooves in the bullet as it exits the barrel. It is considered an inexpensive rifle with very inexpensive and easy to obtain ammo and very little recoil, which makes it perfect for beginning shooters. The best scope for a Marlin model 60 is going to be a simple, accurate and element-resistant scope that is lightweight and low profile. Hopefully, this guide has increased your knowledge about the Marlin 60 and what would be the best scope for it. Perhaps, you even have your eye on one of our top five picks. Whichever scope you go with, don’t over-complicate it. It’s a simple gun that really doesn’t need a lot of improvements. A nice simple scope should do you well. Happy hunting!